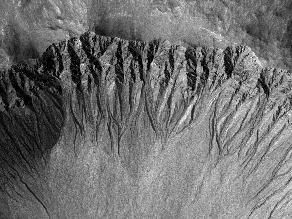 MARS GLOBAL SURVEYOR – Mars is scarred by bone dry gullies nearly everywhere you look. But these caught researchers' attention because they noticed something was changing as they took pictures of the site time and again as Mars Global Surveyor whizzed overhead. Researchers noticed something was apparently flowing – here and now – out of these gullies. That is odd – as the low temperature and low atmospheric pressure on Mars make it hard to imagine liquid water on the surface. But what if there was a vast underground aquifer – heated by Mars core and kept under pressure by virtue of being underground? If that liquid water made it to the surface, what would happen to it? Wouldn't it freeze or sublimate into a a gas right away? Or maybe it flows first? Either way, it is worth imagining that underground aquifer. On earth, wherever you find water – and a source of energy – you find life. Doesn't it stand to reason that is the case on Mars? not to be cofused with above-ground aquifers.